It was still a little tense the next morning as we didn't really have a clear pick up time, name or confirmed price for our taxi to Bajawa but as 10am had been mentioned that's what we aimed for. Sure enough at 10 past 10 a car arrives with a smiley Indonesian guy and says he's there to take us on our journey. For some reason the taxi took us back along the same road the bus had come in on from Ende, which looks longer on the map but I can only assume the other road is not usable. Eventually we arrived at the Happy Happy Hotel in Bajawa and thankfully the price was the agreed 700k rph. Our difficulties didn't end there though as the hotel we were dropped at was fully booked and as the taxi had now left we had to walk back into town. After looking at a couple of rooms in 2 other hotels, which were filthy and not very nice, we decided to walk to the further away Bajawa Roo hotel as it’s not on the main road. It was a hot dusty walk but just as we got close a friendly lady on a scooter drove past said she owned the hotel and could take one of our bags for us. She only had the 1 room left at the slightly over budget price of 400k but we were reaching the end of our patience so took it without question. 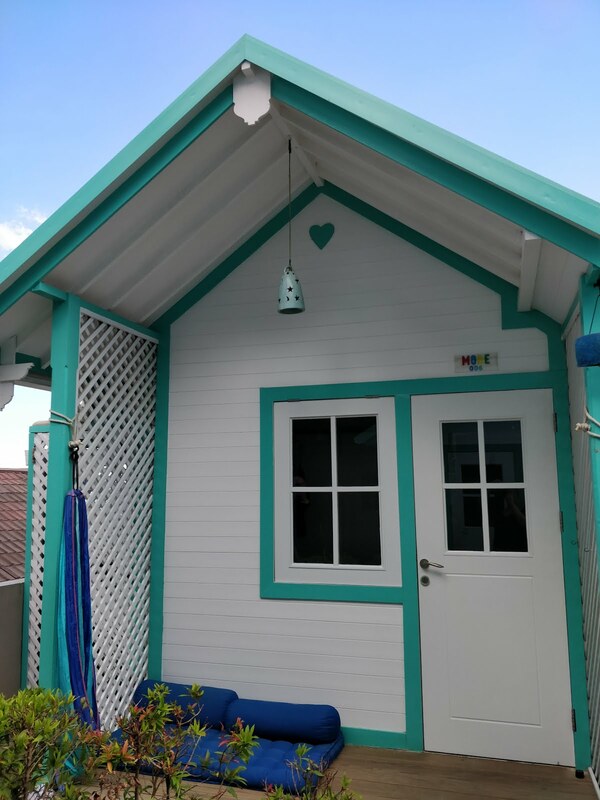 The owner was very friendly and bought us coffee whilst we settled in and said she could cook us dinner that evening of a sweet and sour chicken with rice, which after 2 nights of seafood sounded good. We then had to make a choice of what to do next on Flores. 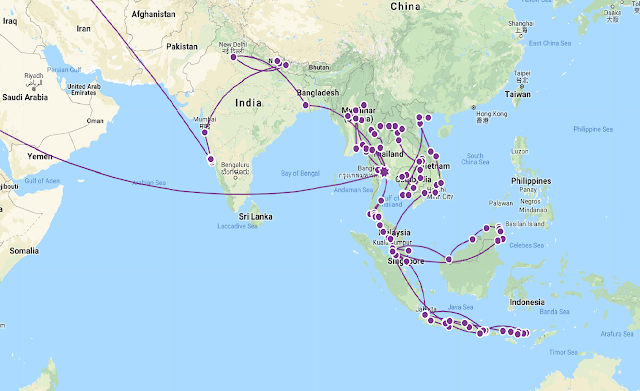 Should we go straight through to Labuhanbajo by bus tomorrow which would be cheap, take 7hs+ but we’d miss seeing Bajawa, or should we split up the journey even though there wasn’t much else we wanted to see and it would take longer. Our host overheard our quandary and said why would you take a long bus journey when you can fly in 35mins from the airport in the neighbouring town. 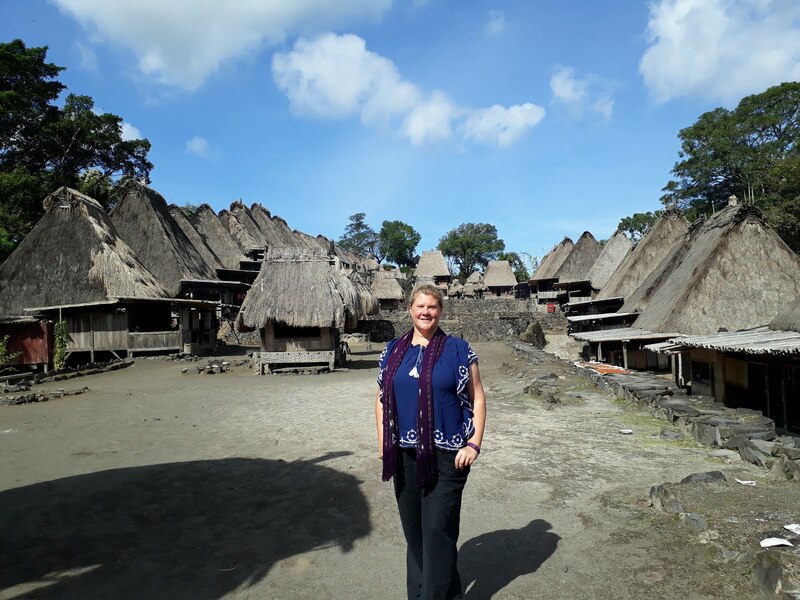 We didn’t think about it for too long as the cost of flying was only about £10 more than the bus and it meant we could spend the extra night in Bajawa but still get to Komodo quickly. 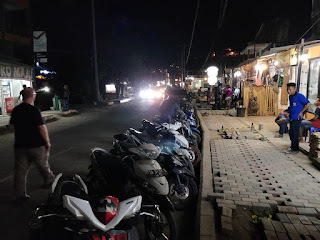 With the extra night at Bajawa Roo hotel being 400k, 2 flights from Soa to Labuhanbajo for 512k rph and 2 scooters rented for the following day for 300k we’d spent a fair bit already so had dinner and an early night. The next morning, we had a simple breakfast upstairs and then got informed that the room we were in had been booked online yesterday evening and so we’d have to vacate it before mid-day! After a bit of a panic and a few words with the manager it was agreed that they hadn’t removed the room from a booking site correctly and as we’d secured the room first we wouldn’t be expected to move. Still feeling a little wound up we set off on our bikes for a day of traditional villages and mountain views. The stunning views as you drive around quickly make you forget any issues you’ve had and you fall in love with this island afresh every day. With no set agenda we headed out towards Bena Traditional Village, on a winding but good sealed road. 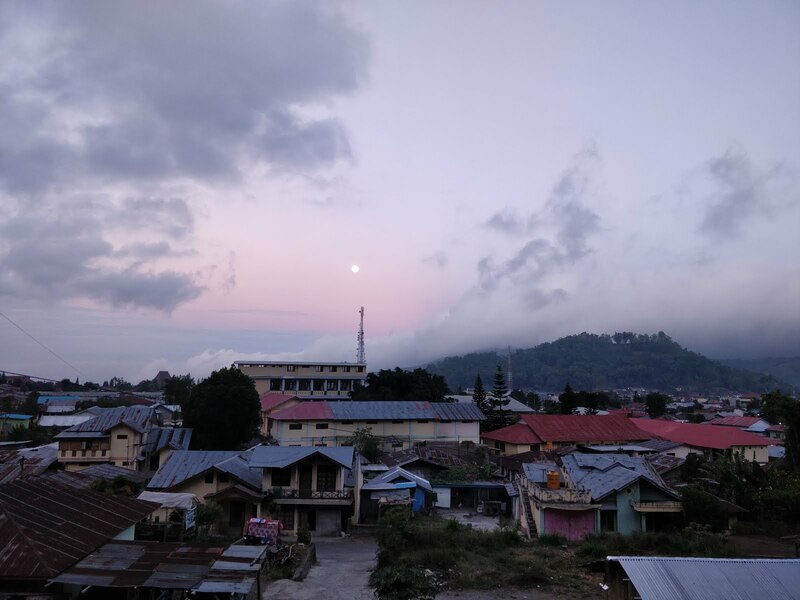 Bena village is probably the most famous old traditional village and is geared up for tourists with a signed carpark and clear place to buy your entrance ticket. Here you sign a book and pay 25k each and get given a scarf to have round your neck – just what you want on a hot humid day, you are then free to wander round as you like. We didn’t have a guide for our visit so missed out on knowing what half the traditional customs and meanings of things were, but it was fascinating looking around. 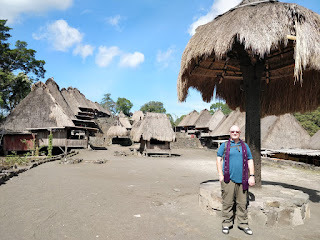 The village itself is immaculate and it can feel a bit staged and fake but equally you can see signs that families do live there and are beginning to utilise modern infrastructures like electricity and satellite tv whilst keeping older customs alive. Back on the bikes we drove around little roads visiting another couple of villages that were less geared for tourists and didn’t ask entry fees and stopping to admire the views of the nearby Mt Inerie. 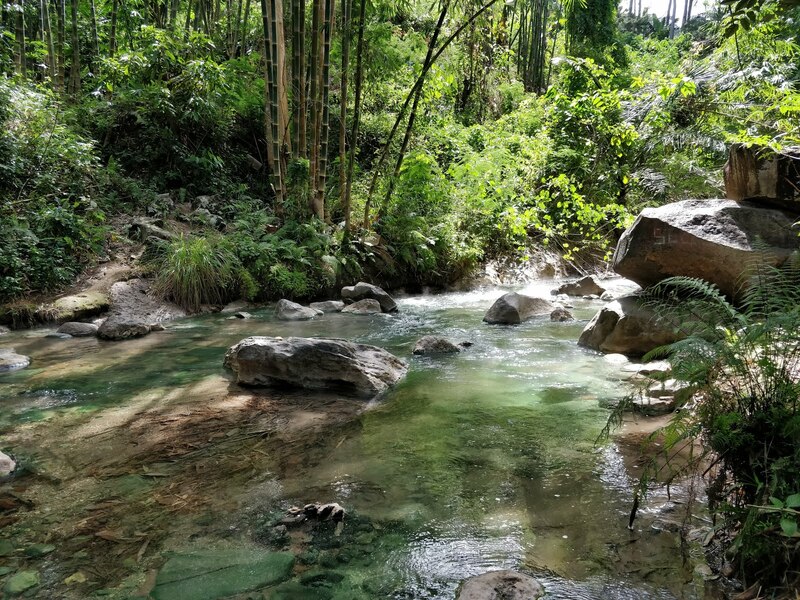 Nearby Bena there is a beautiful natural hot spring that combines an ice-cold stream and piping hot stream to make a fully controllable bathing experience. 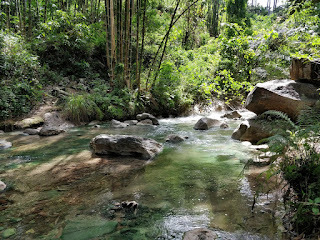 It’s not easy to find as we drove past it the first time and the sign for it is literally a tiny bit of wood balanced on a pile of dirt but once found you walk down to a natural pool, pay the 10k entrance and you can paddle or bathe in the clear water. There is even a changing room and toilet for you to use. We didn’t bring swimming costumes but paddled about a bit before hitting the road again. Paul had been using google maps to navigate us about these back roads and they hadn’t let us down so far but as the road we rode on became more and more unmade we started to wonder if it was about to. We turned a corner to find the road we hoped to take undergoing major roadworks, well really just a pile of rubble with about 30 men working on it. We pointed down it and then to the map to where we wanted to go and they shook their heads but gestured that we could go back the way we came a bit then turn off right. Half of them are chuckling and the other half seem quite eager to help so we thought we’d take their advice, go back a bit then take what looked like a single pathway off into the woods. We bumped along the single footpath for ages, passing farmers and cows who all looked at us like we were crazy to be out there on motorbikes. Eventually the single path became a dirt road that cars or tractors had obviously been along and then again after what felt like miles it became a tarmac road and we were back in a little town. 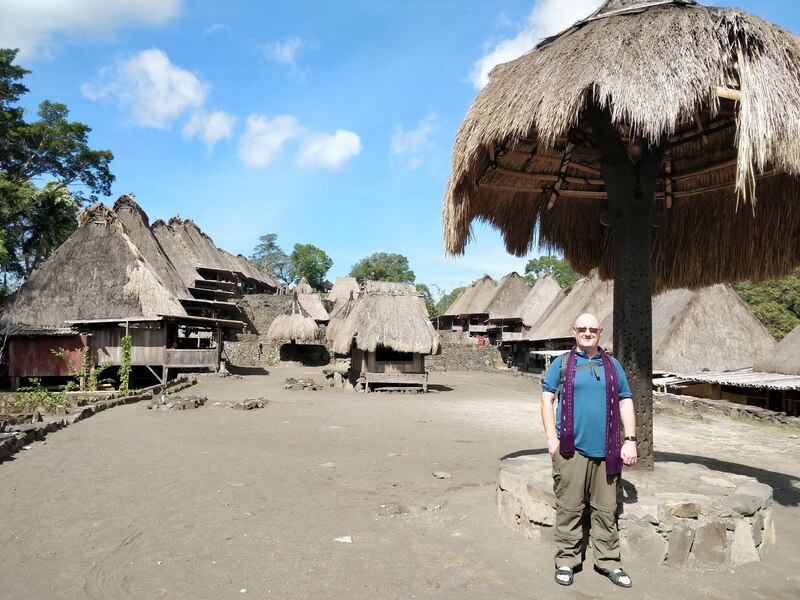 We’d come quite a fair distance east from Bajawa to find the old village of Wogo, which is now represented by standing stones and sounded like an interesting stop. Unfortunately, as we didn’t have a guide and it isn’t marked on the map we couldn’t find it and after driving around for 20mins or so we gave up and just visited the new village site. We were pounced on by an English-speaking villager as soon as we arrived and she appointed herself our guide around the village, introduced us to her children and even made us a cup of coffee in her house…. all for a suggested donation obviously. 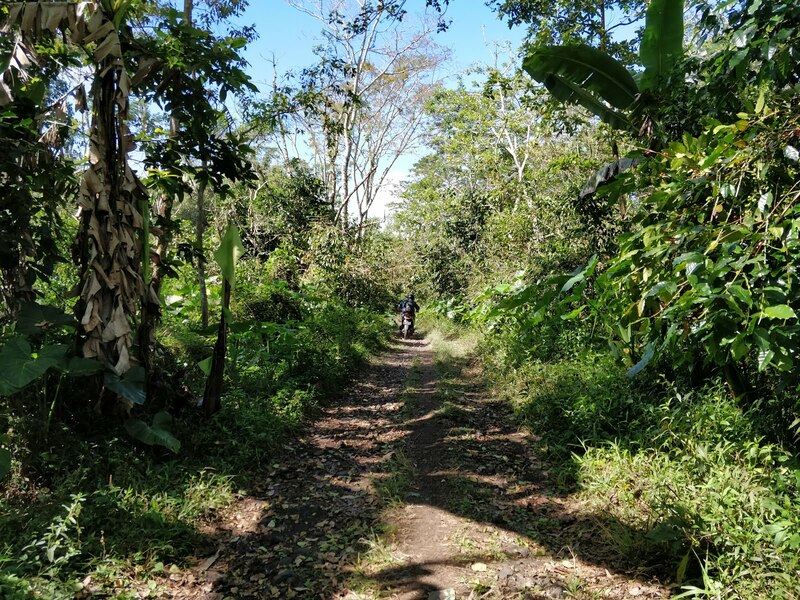 After signing the visitor book and making another donation this time noted in the official register we left and headed back along the main road to Bajawa. That night we walked to a little local café for dinner and had cold beers, Nasi Gorang and Gado for dinner, which was cheap and hit the spot perfectly. 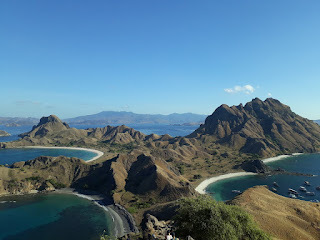 We both wished we’d had more time to base ourselves in Bajawa as there was probably at least another days’ worth of driving around that we could have done but it was time to get excited about Labuhanbajo and exploring Komodo National Park. The hotel had arranged for a taxi to take us to Soa airport at the price of 50k each and took about 30mins. Soa airport is tiny but quite busy as all local flights stop here as they go up and down the island but the terminal is just a small outbuilding with a few chairs, a desk and luggage scanner. After a small delay we were up in the air and as it was just a small prop plane we were flying at a great altitude for seeing the rest of the island below us. We arrived in Labuhanbjo mid-afternoon and as we were staying in a hotel near the airport were able to walk the 10mins to it without paying extortionate taxi fares. Our accommodation for 1 night was the Green Prundi hotel, which we booked as it was cheap and we couldn’t get 3 nights at the place we wanted to in town. It was basic and some of the reviews on Trip Advisor weren’t glowing but for £15 a night inc breakfast it was ok. As with a lot of places it needs some TLC but the gardens were well maintained and the bed was comfortable. Late afternoon we walked the 20mins to the main street in town where all the tour operators, restaurants and bars are. Labuhanbajo although a major tourist gateway to Komodo national park is on first glance a run down, dirty, dusty town that looks on the brink of major change. There is one main road and the pavement is still being constructed, or maybe it’s being dug up again it’s not quite clear and no-one was working on it whilst we were there. In-between finished hotels, tour operators and shops are busy construction sites and interspersed in-between them are local kids all with a boat or a tour that they want to sell you. We wandered along the street collecting info and prices on snorkelling and dragon trips that we could do whilst there and then went to a café to digest all the info we’d collected. What we'd discovered was that if you didn’t dive or want to learn to dive then there aren’t many cheap snorkelling trips, but if you knew a diver then you can tag along with the dive boats no problem. As didn’t know any divers and not all the dive sights are snorkel friendly, that cut our options considerably plus we were only staying in town for 3 nights and as we were moving hotel the following day that only really left 1 day that we could do a trip on without changing our future plans. There was a day tour operated by Alexandria that offered all the top sights by speedboat for 1,200k rph which kept coming up and as we were short on time we decided to bite the bullet and go for it. We got it all booked in that evening and walked back to our hotel pleased with our choice. Saturday was going to be mainly moving hotel and then we hoped to maybe explore some more of the town, have a swim and relax a bit before planning our route off Flores….this wasn’t to be as we got a message mid-morning from Alexandria tour company to say that their boat had been sabotaged and they couldn’t run the trip for the next few days! We were gutted as that company had brilliant reviews and didn’t really want to go with another company, especially knowing that one of the other companies might have been responsible for the damage. We couldn’t really afford to stay longer as Labuhanbajo as although still being developed has already got quite a hefty tourism price tag on most things, so we hit the internet and emailed a few companies that offered the same tour at similar costs, then packed up our stuff to move down into the dusty heart of the town. Our next accommodation was at Le Pirate which offers small cute beach hut style cabins with ensuite bathrooms for a mid-range price tag of £32 a night inc breakfast, it’s all about the location with this place as they are right on the main street, have a small pool, rooftop bar and large restaurant. 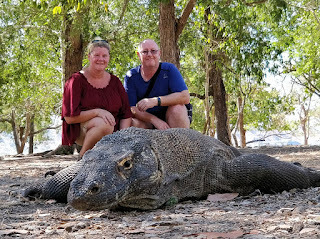 We finally found another tour operator, Alba Cruise, that were doing the same speedboat tour around Komodo but the reviews they had recently had on trip advisor weren’t exactly glowing. As we were running out of options we decided to risk it and took 2 of the last tickets available for the tour the next day. Pickup would be at 5:30am from the hotel and we would visit at least 5 of the top tourist locations in the national park before being returned to our hotel around 5pm. The next morning, we struggled out of bed, were given the poorest excuse of a breakfast box by Le Pirate (2 slices of bread, 1 pot of marg, 1 banana) and then collected from the roadside by Alba cruise. We got dropped off at a fancy resort called Laprima where we and around 20 other people waited for the signal to head to the private jetty. The speedboat itself was ok but the only proper seating is inside an enclosed cabin, where the aircon froze the people in the front row and didn’t circulate any air by the time it got to the back. I perched on a slightly wet seat by the engines and although the diesel smell was strong I was outside and could see the horizon so was happy. First stop is Padar Island and the 30-min hike to the top for stunning views. The climb is relatively easy and you get 1.5 hrs there so can take it quite slowly which is good as you are stopping every 10 steps or so to take photos. The most famous picture that you see of Padar is the view from near the top of the 3 different coloured beaches (black, white and pink) but the views all around are breath-taking. Paul clambered a bit further up the hill that I did and some other people were carrying on down and up to different viewpoints but the views would have been very similar. 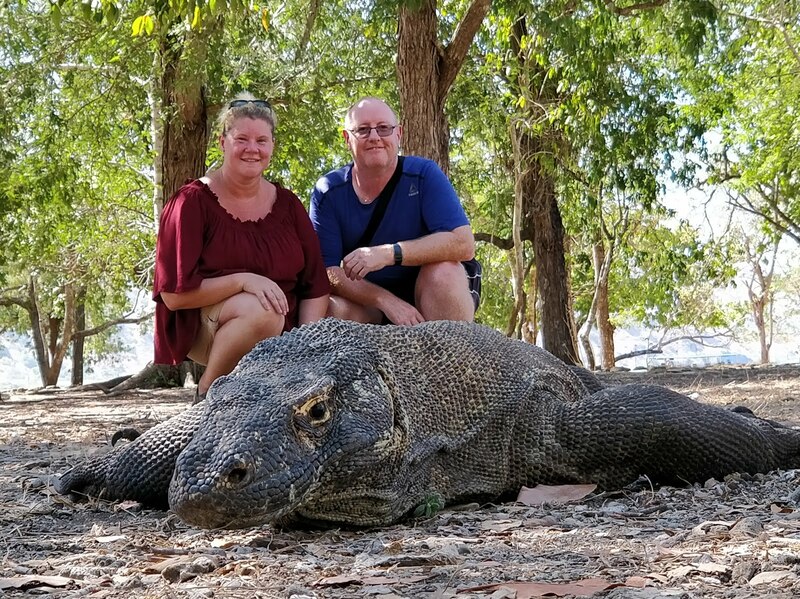 Our next stop was the island of Komodo where we would join a ranger to hunt for some dragons, which I was really excited about. Just before we arrived on the island the boat crew went around asking for the Komodo entrance money, which was 350k, we’d heard that it’s better to buy your tickets directly from the ranger station so said we would do that and the boat crew just shrugged like it made no difference. Whilst we were buying our tickets we saw that the boat crew only officially paid for around 15 tickets, when there was definitely more than that on the cruise and later on we saw more money change hands that hadn’t gone through any books so there is some sort of back handers going on there, but I guess that’s the norm. Sadly, we hadn’t realised that June, July and August were mating season and the dragons are notoriously hard to spot in these months so during the briefing we were warned not to get our hopes up too much, and after a few words on how dangerous they can be we set off as a huge group. It was probably because it was already getting hot and we were such a large group of mixed ages and fitness levels that the route we took didn’t resemble any of the trails listed on the huge map we saw at the start and as they had received word that there was one nearby the rangers huts we headed there first. Sure enough lying in the dappled shade just off the walking path was a medium sized male Komodo Dragon. It seemed to just be quite happy having a nap but was clearly used to people as we got quite close without freaking him out. Here the ranger told us a bit more about them and they were able to stage a few photos so it looked like we were crouched right next to him. It was a typical tourist set up and I’m sceptical about how he was just conveniently lying there but it meant we did get to see at least one whilst we were there. The rest of the short walk through the scrubland didn’t show us any more dragons but we saw an old nest site and talked a bit more about their habitat and the islands before heading back to the boat. 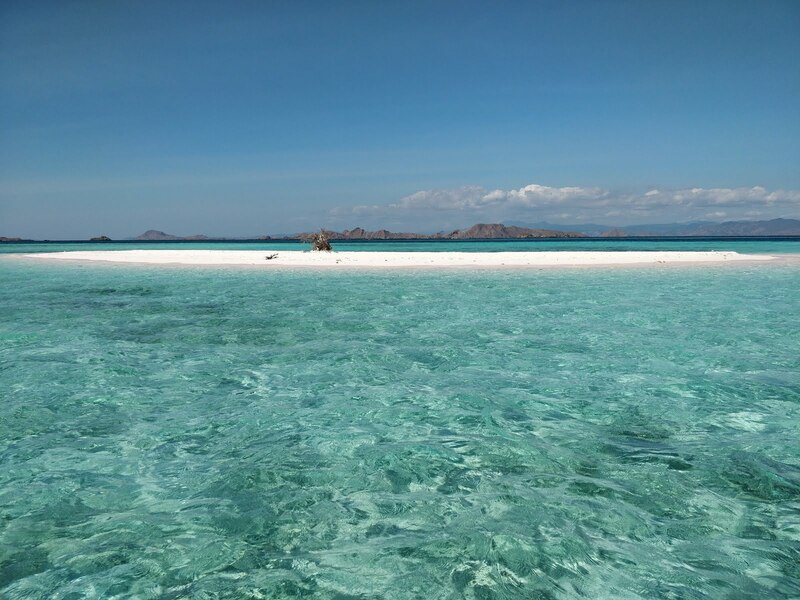 We weren’t scheduled to stop there but the crew let us spend 30 mins snorkelling on Pink Beach, which is just round the corner on Komodo Island and is caused by the sand being made up of red coral. It’s quite subtle and very pretty and the coral reefs just off the beach made for some nice snorkelling time. After we left here we were given our lunch boxes, which consisted of a bit of rice, some vegetables and a tiny bit of fried chicken. It was a meagre lunch but we’d bought some crisps and biscuits to supplement it and there was a limitless supply of water bottles for you to drink. The 4th stop was Manta Point, where the Manta Rays can sometimes be seen. They are quite hard to spot and so you normally stay in the boat until the driver or spotter sees one and then you can all pile in, this is done straight from the boat side in very deep water and not surprisingly not everyone was eager to get in. We had heard the best time to see the Mantas was in the morning and as this was now early afternoon we just had our fingers crossed that they would still be about. Although we did get the ‘Manta Manta’ shout from the driver by the time we’d got in the water he was long gone, and as it’s such a deep spot the visibility through the blue haze is quite hard. We did see the most amazing huge school of blue fish that surrounded us and switched directions and then Paul excitedly points out that just below us and under the fish was a Hawksbill Turtle swimming off into the blue. I tried to follow but she was very quick and by now the boat had drifted a fair way from us so we turned back towards safety. It took a fair amount of effort to fight the currents and get back to the boat and I suspect the crew didn’t fancy doing all that again so once we were all onboard we set off to the next location on the list. 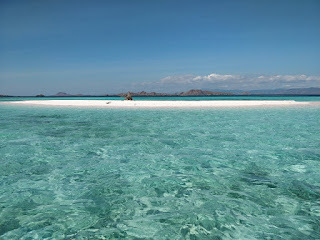 Taka Makassar is a tiny island / bar of sand in the middle of the ocean, which has very shallow water all around it. This makes it quite good for snorkelling and as the water is shallow only a few smaller boats can get there, although it’s so small that by the time everyone gets out of your boat it can feel quite crowded. If you can get a picture without anyone else in it the turquoise of the water and white sand make a stunning backdrop. We spent about 40 mins here, which was just long enough and then we headed off to our last stop for the day, Kanawa Island. I think everyone on the boat was shattered by now as we all drifted off to sleep on the short trip across the water to this small but inhabited island. We headed straight to the café on the beach when we arrived for a cool beer and I was honestly thinking I’d skip the last snorkel session and just read my book for the last half hour or so. Paul managed to convince me that the water looked good straight off the pier next to the boat, so we dumped out stuff and just jumped straight in. I’m so glad that I didn’t skip this snorkel as the water if possible was even clearer here and there was thousands of fish and a very healthy coral reef with drop off. Paul had to go back for the underwater camera as we didn’t want to miss getting this on film. Under the jetty we had a school of big yellow angel fish just hanging about and as I swam along the drop off edge I saw a Lion Fish, with all his spikey frilly fins. 20mins went by too quickly and we soon had to get back on the boat for our trip back to the mainland. I’m sure if you had a lot more money and time that there are many hidden gems in Komodo National Park, and I think the chances of seeing Komodo Dragons are slightly higher on Rinca island but I felt we had seen some of the best bits for quite a reasonable price and was happy to move on the next day.